If you have taught many novels, these activities will be easy to implement. If you’re looking for a great read for your level 3/4 classes, this is so engaging! All activities I will be sharing as my class reads the novel are activities that supplement the published . The teacher’s guide is a MUST have but these activities compliment what is already there! These activities have been created and shared with the consent of . Please keep in mind that any time you create and share materials that may be derivatives of another author’s work, it is important to get consent in writing! So many people work so hard to create these materials, it is important to respect their copyright! In my classroom, preteaching the novel starts with El Salvador’s Civil War. We look at how Oscar Romero, the assassinated Salvadoran Archbishop, created a movement among the poor that led to an uprising against the government. From the war we are able to look at the many who fled El Salvador for what they hoped would be safety in the United States… and here we connect with the gang. As a prequel to the novel, we listen to the song Gangsta in Spanish by Kat Dahlia and talk about what it means to be a gangster? What does it mean to have a “gang family” versus a traditional family? We watch the documentary “The World’s Most Dangerous Gang” and read the prologue to the book to build background knowledge, and then its time to dive in! 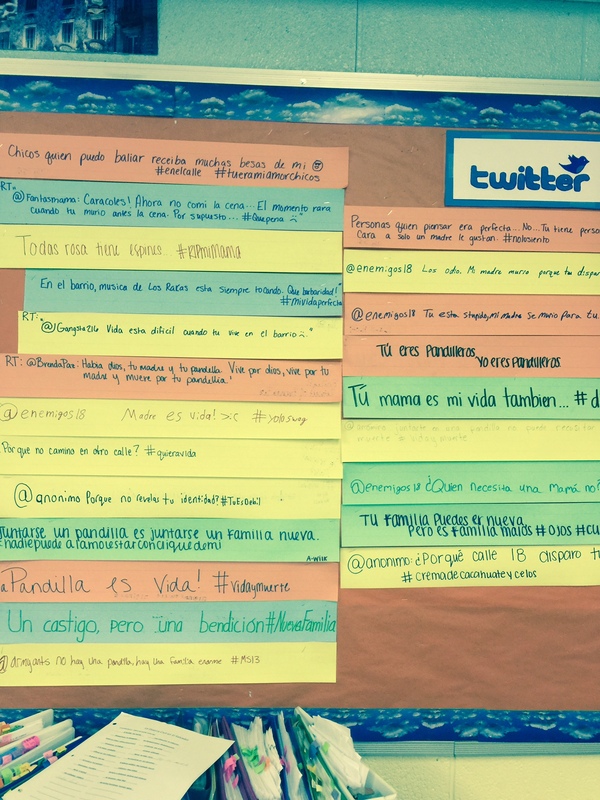 Underpinning the entire novel study is our classroom Vida y muerte twitter feed. Students add to the feed daily as we read. 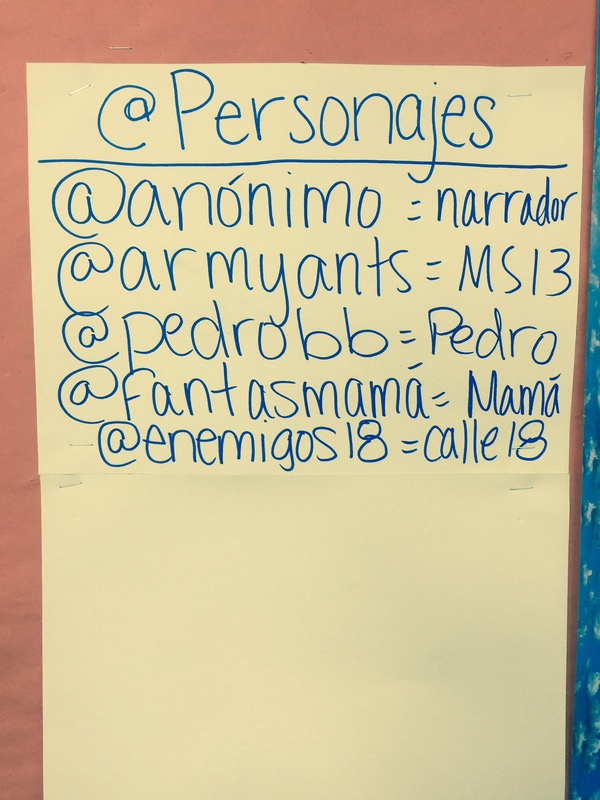 It helps them engage with characters as they create their twitter handles! Or as they compose tweets that flow with the novel! Email me and I can send you the doc! Would you be willing to send me the twitter doc as well? It is part of the teacher’s guide! Thank you SO much for sharing these! I’m just starting Vida y Muerte with my 3s this week, and was a bit overwhelmed by the plethora of resources (but what a great problem to have!). I can’t wait to see what else you do. Carrie, do you use Voces Inocentes also? I do!!! And Sin Nombre too! These activities and resources are wonderful, but I am in a tough spot about this. We have a big Salvadorean community in out town, and last week two underclassmen were suspended because they had MS13 colors and drawings in their hands. This behaviour could get them in harms way, in serious trouble even. Our VP was livid, the police was called, it was very sad to see the mothers crying because they have been working three jobs for years to bring their children here, away from the Maras. I don’t think this book is the one I want to read with my students. We did see Voces Inocentes and read La Guerra Sucia and watch Sin Nombre, but I am non tenured and don’t want to rock the boat! Thanks you for sharing your enthusiasm and devotion…and your activities and ideas! You’re right! Your situation would make this book difficult! Maybe you can take the activities and adapt them for a more appropriate text! Thank you for this. I am going to try it with my class who have just started reading “Viva el Toro”. I have quoted your website at the bottom of the handout. Hope this is ok! Muchas gracias. I am going to use this for my Level 1 class reading “Viva el Toro” and will cite your website in the instructions. Can you tell me which documentary you used-I went on YouTube and entered “World’s Most Dangerous Gang” and quite a few came up. I am just wondering which one you recommend. Thank you so much-looking forward to using this with my Spanish 4+ students!! The one I’ve always used is gone now and I haven’t found one nearly as good to replace it! It had Lisa Ling in it but NatGeo has completely made it disappear! I wanted to know if you can send me the link to the documentary. Is it appropriate for High school students?